How good are you at music trivia? Well, if you’re a pro, put your talents to use in the SIRIUS Face The Music Contest. 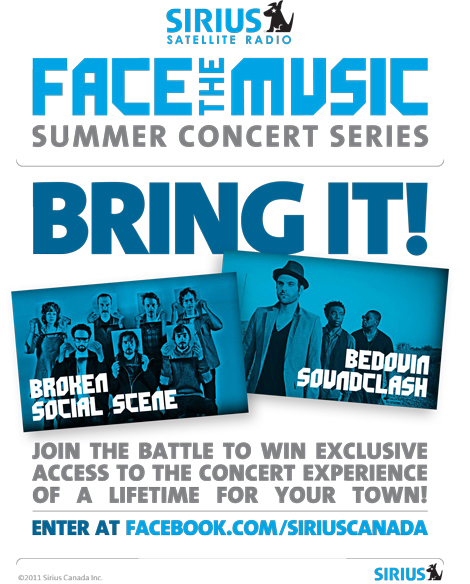 Face The Music gives fans from across Canada the chance to win an intimate concert in their city by playing a “name that tune” style music game. Which ever city ends up with the highest score will host one of these “big-band-in-a-small-venue” shows, while anyone who’s competing has the chance to win a trip to the concert of your choice in the next two weeks, just by getting the highest score in the game. The shows will happen in August and feature a who’s who of big Canadian bands. Indie Music Filter will be representing the Central region, so stay tuned to get updates on how that region is doing and which cities are close to winning a show. Also, we’ll have the opportunity to give away tickets and more prizes as the contest continues into summer. Try the Face The Music Contest. I’ve tried it a couple times, turns out I’m not really great at it, but getting better. My memory for music ain’t what it used to be.